First studied to be a geriatric auxiliary nurse. Pilar discovered yoga at 19 years of age in her home city of Reus, and quickly immersed herself in this age-old science. 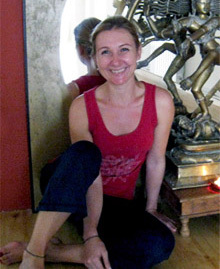 After a number of years practicing yoga, she decided to study it in greater depth, joining a course for teachers. This gave her the opportunity to get to know ex-suamis from the Vishnu Devananda organization, who would prove to be a great source of inspiration for her. Later on, she would continue her studies under the tutelage of a number of different Suamis and dedicated practitioners. In 2001, Pilar, together with Xavier Sola – the most important person at this stage of her personal development – decided to open Yoga Studio Barcelona as a place where people could discover a greater and more integral sense of wellbeing.